Context: The ability to detect important auditory signals while performing visual tasks may be further compounded by background chatter. Thus, it is important to know how task performance may interact with background chatter to hinder signal detection. Aim: To examine any interactive effects of speech spectrum noise and task performance on the ability to detect signals. Settings and Design: The setting was a sound-treated booth. A repeated measures design was used. 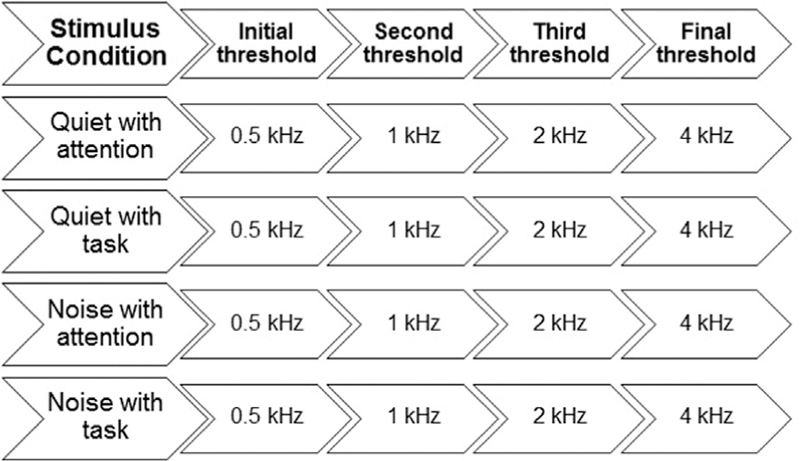 Materials and Methods: Auditory thresholds of 20 normal adults were determined at 0.5, 1, 2 and 4 kHz in the following conditions presented in a random order: (1) quiet with attention; (2) quiet with a visuo-spatial task or puzzle (distraction); (3) noise with attention and (4) noise with task. Statistical Analysis: Multivariate analyses of variance (MANOVA) with three repeated factors (quiet versus noise, visuo-spatial task versus no task, signal frequency). Results: MANOVA revealed significant main effects for noise and signal frequency and significant noise–frequency and task–frequency interactions. Distraction caused by performing the task worsened the thresholds for tones presented at the beginning of the experiment and had no effect on tones presented in the middle. At the end of the experiment, thresholds (4 kHz) were better while performing the task than those obtained without performing the task. These effects were similar across the quiet and noise conditions. Conclusion: Detection of auditory signals is difficult at the beginning of a distracting visuo-spatial task but over time, task learning and auditory training effects can nullify the effect of distraction and may improve detection of high frequency sounds. Context: Distortion product otoacoustic emissions (DPOAEs) may indicate preclinical noise-induced hearing loss (NIHL) in adolescents from unsafe personal music player (PMP) use. Aims: The objective, therefore, was to observe preclinical signs of NIHL in 9th grade adolescents with clinically normal hearing by comparing DPOAE signals between different levels of A-weighted equivalent PMP exposure. Settings and Design: Subjects were recruited from all secondary-level schools located in the city of Regensburg, Germany during two academic years 2009/2010 and 2010/2011. Subjects and Methods: A-weighted equivalent sound pressure levels (SPLs) for a 40-hour work week (LAeq,40h) were estimated from questionnaire responses on output and duration of PMP use of the previous week. Subjects were then categorized into four levels of exposure: <80, 80–85, >85 to <90, and ≥90 A-weighted Decibel [dB(A)]. DPOAE signals were collected by trained audiological staff, applying a standard optimized protocol, at the Department of Otorhinolaryngology of the University Hospital Regensburg. 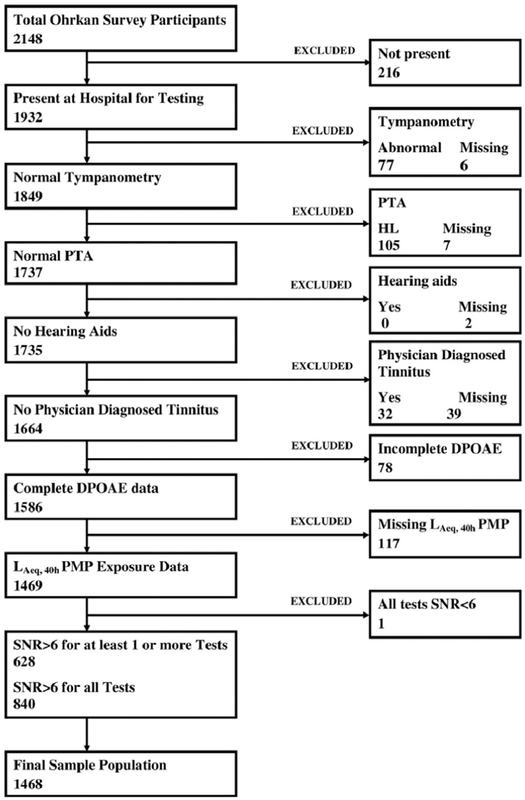 Statistical Analysis Used: Mean DPOAE signals were compared between levels by unpaired t test. Novel linear regression models adjusting for other leisure noise exposures and with outcome variables DPoutcome and 4 kilo Hertz (kHz) DPOAEs estimated effects between levels. Results: A total of 1468 subjects (56% female, mostly aged 15 or 16 years) were available for analysis. Comparison of DPOAE means by PMP exposure typically showed no greater than 1 dB difference between groups. In fact, comparisons between ≥90 dB(A) and <80 dB(A) presented the least differences in magnitude. Both DPoutcome and 4 kHz linear regression models presented a weak association with the 4-level PMP exposure variable. An expected dose-response to PMP exposure was not observed in any analyses. Conclusions: DPOAE signal strength alone cannot indicate preclinical NIHL in adolescents. Context: Despite existing preventive measures, the number of acute acoustic trauma (AAT) cases reported to the French Military Epidemiological Surveillance System (MESS) remains high. Aims: The objective of this study was to describe AAT and the preventive measures already implemented. Subjects and Methods: We conducted a descriptive cross-sectional analysis of AAT using data from the MESS for the period 2007–2014. In addition, we reviewed the current prevention measures that exist in the French armed forces. Statistical Analysis Used: Comparisons between different incidence rates were made by Poisson and quasi-Poisson regression. Results: Between 2007 and 2014, 10,487 AAT cases were reported to the MESS, with a significant decrease in 2013 (P < 0.001). AAT incidence rates were the highest among those aged <25 years − 14.3 per 1000 person-years (PYs) (P < 0.001), and those in the army; with 8.1 per 1000 PYs (P < 0.001), and men had almost twice the risk of women (P < 0.001). AAT mainly occurred in training schools or at camps during exercises. The main prevention actions identified were the following: official regulations, education, making hearing protection devices (HPDs) available for all service members, and regular hearing monitoring. A working group has been set up and has proposed an informative chapter in the weapon handling instruction book, an AAT simulator, and a new HPD, the 3M® earplug, with an information brochure. Conclusions: AAT rates decreased from 2007 to 2014 in the French armed forces. Further analysis is needed to identify the underlying factors involved to improve the prevention actions proposed. The MESS and targeted surveys will assess the impact of the different prevention measures implemented. Introduction: The viability of hearing protection device (HPD) verification (i.e., fit-testing) on a large scale was investigated to address this gap in a military accession environment. Materials and Methods: Personal Attenuation Ratings (PARs) following self-fitted (SELF-Fit) HPDs were acquired from 320 US Marine Corps training recruits (87.5% male, 12.5% female) across four test protocols (1-, 3-, 5-, and 7- frequency). SELF-Fit failures received follow-up to assess potential causes. Follow-up PARs were acquired (Experimenter fit [EXP-Fit], followed by Subject re-fit [SUB Re-Fit]). EXP-Fit was intended to provide a perception (dubbed “ear canal muscle memory”) of what a correctly fitted HPD should feel like. SUB Re-Fit was completed following EXP-Fit to determine whether a training recruit could duplicate EXP-Fit on her/his own without assistance. Results: A one-way analysis of variance (ANOVA) (N = 320) showed that SELF-Fit means differed significantly between protocols (P < 0.001). Post-hoc analyses showed that the 1-freq SELF-Fit mean was significantly lower than all other protocols (P < 0.03) by 5.6 dB or more. No difference was found between the multi-frequency protocols. For recruits who were followed up with EXP-Fit (n = 79), across all protocols, a significant (P < 0.001) mean improvement of 25.68 dB (10.99) was found, but PARs did not differ (P = 0.99) between EXP-Fit protocols. For recruits in the 3-freq and 5-freq protocol groups who experienced all three PAR test methods (n = 33), PAR methods differed (P < 0.001) but no method by protocol interaction was found (P = 0.46). Post hoc tests showed that both EXP-Fit and SUB Re-Fit had significantly better attenuation than SELF-Fit (P < 0.001), but no difference was found between EXPFit and SUB Re-Fit (P = 0.59). 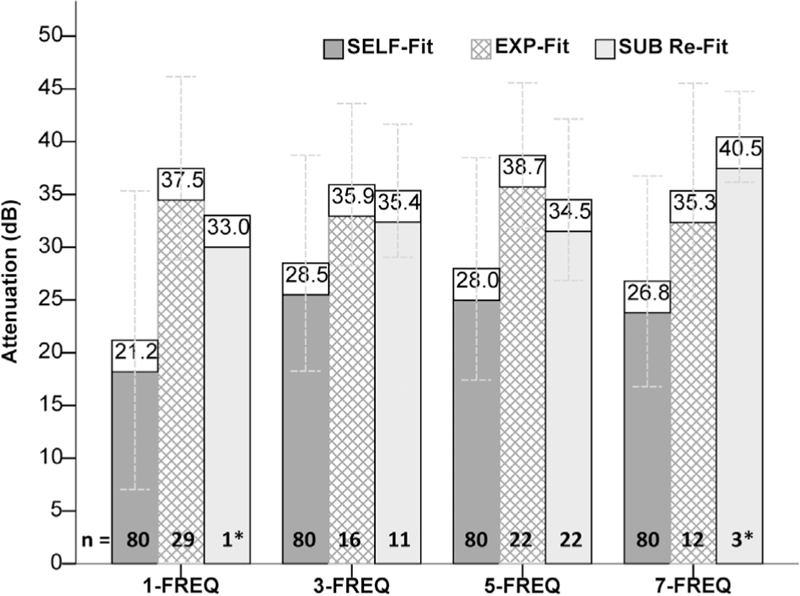 For SELF-Fit, the 1-freq protocol resulted in a 35% pass rate, whereas the 3-, 5-, and 7-freq protocols resulted in >60% pass rates. Results showed that once recruits experienced how HPDs should feel when inserted correctly, they were able to properly replicate the procedure with similar results to the expert fit suggesting “ear canal muscle memory” may be a viable training strategy concomitant with HPD verification. Fit-test duration was also measured to examine the tradeoff between results accuracy and time required to complete each protocol. Discussion: Results from this study showed the critical importance of initial selection and fitting of HPDs followed by verification (i.e., fit-testing) at Navy and Marine Corps accession points. Achieving adequate protection from an HPD is fundamentally dependent on obtaining proper fit of the issued HPD as well as the quality of training recruits receive regarding HPD use. Objective: The objective was to describe the speech intelligibility in noise test results among Dutch teenagers and young adults aged 12–24 years, using a national online speech reception threshold (SRT) test, the Earcheck. A secondary objective was to assess the effect of age and gender on speech intelligibility in noise. Design: Cross-sectional SRT data were collected over a 5-year period (2010–2014), from participants of Earcheck. Regression analyses were performed, with SRT as the dependent variable, and age and gender as explaining variables. To cross-validate the model, data from 12- to 24-year olds from the same test distributed by a hearing aid dispenser (Hoorscan) were used. Results: In total, 96,803 valid test results were analyzed. The mean SRT score was −18.3 dB signal-to-noise ratio (SNR) (standard deviation (SD) = 3.7). Twenty-five percent of the scores was rated as insufficient or poor. 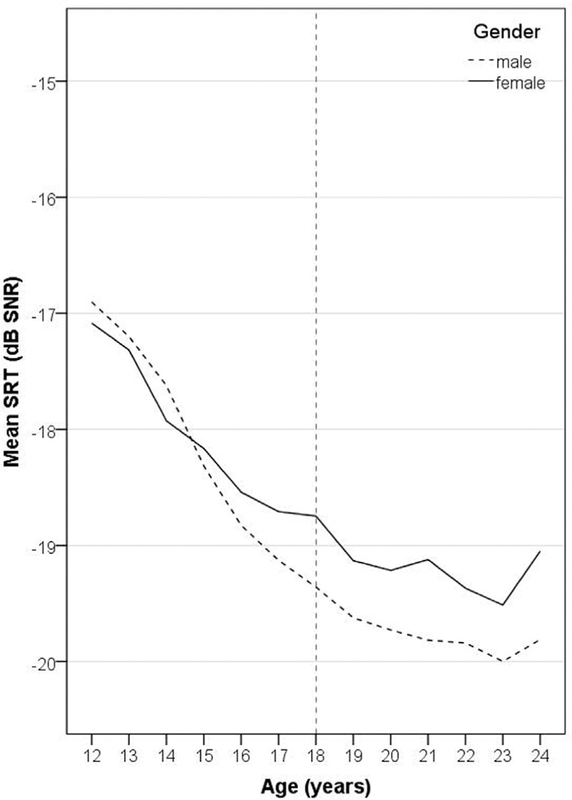 SRT performance significantly improved with increasing age for teenagers aged 12–18 years by 0.49 dB SNR per age-year. A smaller age-effect (0.09 dB SNR per age-year) was found for young adults aged 19–24 years. Small differences between male and female users were found. Conclusion: Earcheck generated large quantities of national SRT data. The data implied that a substantial number of users of Earcheck may have some difficulty in understanding speech in noise. Furthermore, the results of this study showed an effect of gender and age on SRT performance, suggesting an ongoing maturation of speech-in-noise performance into late adolescence. This suggests the use of age-dependent reference values, but for this purpose, more research is required. Background: The Occupational Health and Safety (OH&S) literature shows that noise could represent a risk factor for professional orchestral musicians. The continuative exposition to elevated noise levels and the particular nature of the activity make necessary an “atypical” OH&S approach, which was identified to be necessarily organizational. 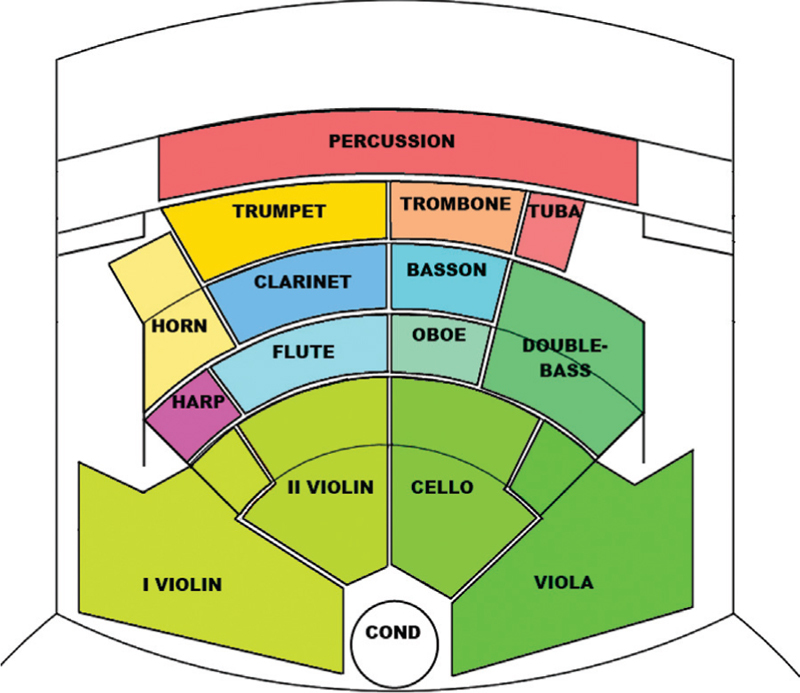 Materials and Methods: In this study, a parametric-based method for orchestral exposure assessment and management was developed. The goal was to achieve a predictive tool to involve safety in the decision making of concert season program. After setting the parameters, the project’s hypothesis was defined and then validated through a yearly-scale monitoring on an important European symphonic orchestra. Moreover, workers’ exposure was assessed from the parametric study by a wide measurement campaign. Results: A general validation of the method was obtained by the verification of the main parameters’ (repertoire, headcount, and disposition) significant influence on the sound pressure levels produced by the orchestra. Exposure levels comparable to the trends in literature for symphonic orchestras were observed, with criticalities among brass musicians, which was the only group exceeding the upper exposure action values. Conclusion: This research has emphasized that the exposure condition of musicians can be critical and requires the implementation of improvement plans. The study has shown that the predictive analysis can be performed on parameters describing the concert’s emissive characteristics. The future development of research currently under study will focus on the concert’s pieces and the use of parameters as indicators of the exposure context. Introduction: Tramway has become a serious urban noise source in densely populated areas. The disturbance from squealing noise is significant. Curve squeal is the very loud, tonal noise emitted by tram operation in tight radius curves. Studies had reported a relationship between noise levels and health effects, such as annoyance, sleep disturbance, and elevated systolic and diastolic blood pressure. Materials and Methods: This study aimed to analyze the wheel squeal noise along the tramway line in Košice, Slovakia, review the effects on human health, and discuss its inclusion in the design method. To observe the influence of a track curve on noise emission, several measurement points were selected, and the noise emission was measured both in the curve and in the straight lines employing the same type of permanent way. Results: The results in the sections with the radius below 50 m were greatly affected by the presence of a squeal noise, while the resulting noise level in the sections with the radius above 50 m depended on their radius. The difference between the average values of LAeq with and without the squeal in the measurement points with the radius below 50 m was 9 dB. The difference between the measurements in the curve sections with the radius below 50 m and those in the straight line was 2.7 dB. Conclusion: The resulting noise level in general was influenced by the car velocity and the technical shape of the permanent way. These results can be used in noise prognoses and in the health effect predictions. Introduction: Noise is one of the most extensive environmental factors affecting the general population. The present study is focused on the association between discomfort caused by noise and the incidence of certain diseases (ischaemic heart disease, stroke and hypertension). 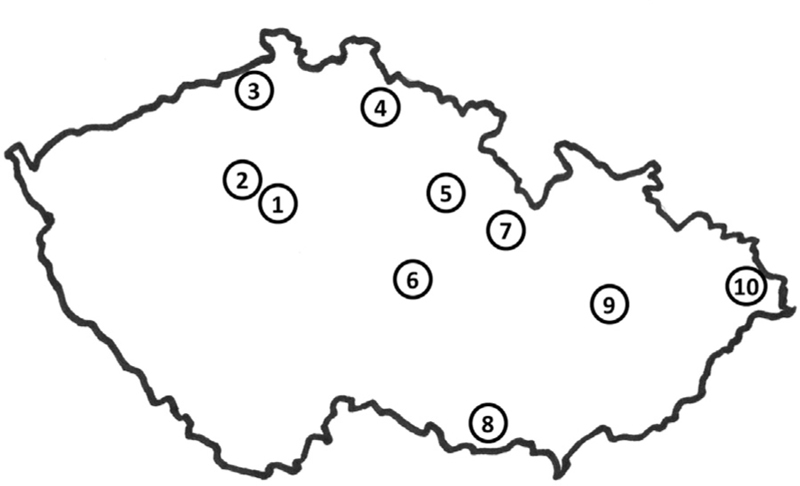 Materials and Methods: This cross-sectional questionnaire study, conducted in 10 cities in the Czech Republic, comprises two stages with 3592 obtained questionnaires in the first phase and 762 in the second phase. Twelve variables describe subjective responses to noise from different sources at different times of day. The intensity of the associations between variables was measured by correlation coefficient. Logistic regression was used for fitting models of morbidity, and confounders such as age and socio-economic status were included. The hypotheses from the first phase were independently validated using data from the second phase. Results: The general rates of noise annoyance/sleep disturbance had greater correlation with traffic noise variables than with neighbourhood noise variables. Factors significantly associated with diseases are: for hypertension − annoyance by traffic noise (the elderly, odds ratio (OR) 1.4) and sleep disturbance by traffic and neighbourhood noise (the elderly, OR 1.6); for ischaemic heart disease − the general rate of noise annoyance (all respondents, OR 1.5 and the adults 30–60 years, OR 1.8) and the general rate of annoyance and sleep disturbance (all respondents, OR 1.3); for stroke − annoyance and sleep disturbance by traffic and neighbourhood noise (all respondents, OR 1.8). Conclusion: Factors that include multiple sources of noise or non-specific noise are associated with the studied diseases more frequently than the source-specific factors. Introduction: The purpose of this study was to evaluate noise levels in dental offices and to estimate the risk and prevalence of tinnitus and noise-induced hearing loss (NIHL) in practicing dentists. 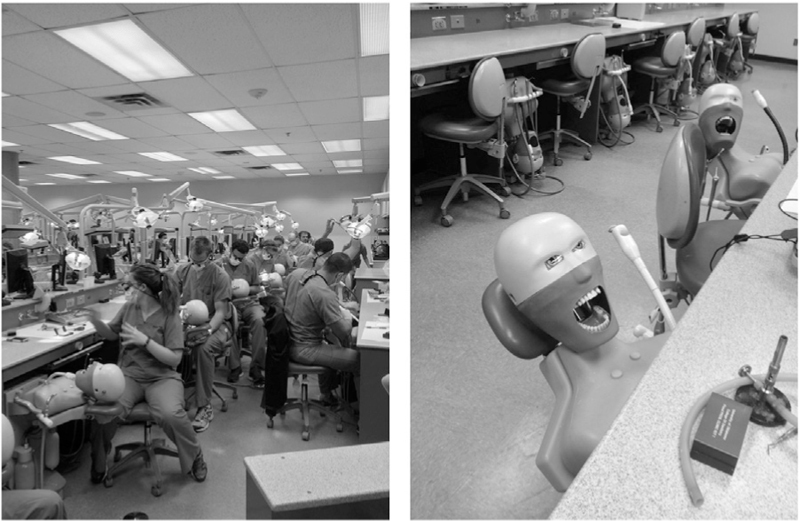 Materials and Methods: First, measures were collected of sound pressure levels produced by dental handpieces and dental suction in the University of Oklahoma Health Sciences Center (OUHSC) College of Dentistry. Second, a survey was distributed to members of the Oklahoma Dental Association (ODA). Results: Measurements made in the dental operatory revealed dangerous levels when high-volume suction was in use alone and in conjunction with a dental handpiece. Questionnaire results suggested that practicing dentists report sensorineural hearing loss at a rate broadly in line with national averages. However, dentists reported a higher prevalence of tinnitus symptoms than would be expected based on sample demographics. Conclusion: Results from sound level measurements and questionnaire responses indicate that dentists are a population that could be placing their hearing health at risk in a typical daily work environment. Objectives: The aim of this study was to examine the relationship between noise exposure and risk of occupational injury. Materials and Methods: Korean National Health and Nutrition Examination Survey was used for the current study. Self-report questionnaires were used to investigate occupational injury and exposure to noise, chemicals, and machines and equipments. 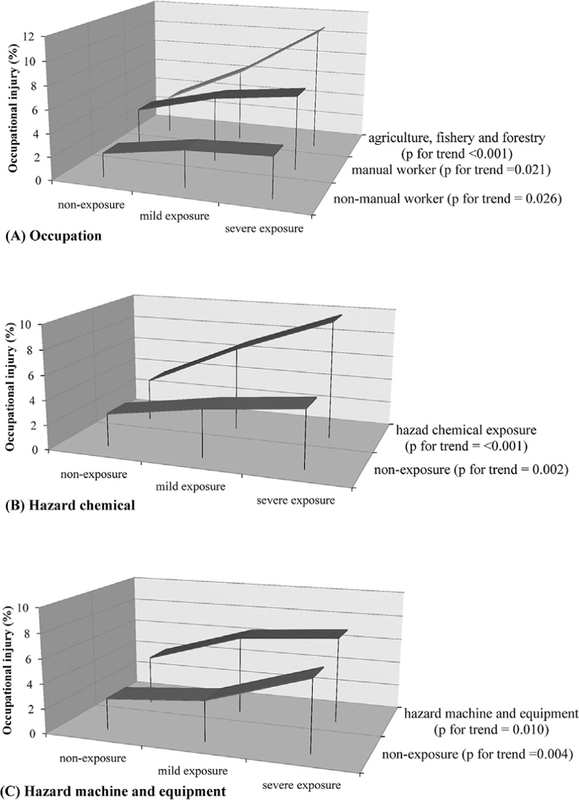 Results: In separate analyses for occupation and occupational hazard, the proportion of occupational injuries increased according to severity of noise exposure (all P < 0.05). Compared to the non-exposure group, the respective odds ratio (95% confidence intervals) for occupational injury was 1.39 (1.07–1.80) and 1.67 (1.13–2.46) in the mild and severe noise exposure groups, after controlling for age, gender, sleep hours, work schedule (shift work), and exposure status to hazardous chemicals and hazardous machines and equipments. Conclusions: The current study highlights the association between noise exposure and risk of occupational injury. Furthermore, risk of occupational injury increased according to severity of noise exposure. Background: Chronic exposure to noise is known to cause a wide range of health problems including extracellular matrix (ECM) proliferation and involvement of cardiovascular system. There are a few studies to investigate noise-induced vascular changes using noninvasive methods. In this study we used carotid artery intima-media thickness (CIMT) and aortic augmentation as indices of arterial properties and cystatin C as a serum biomarker relating to ECM metabolism. 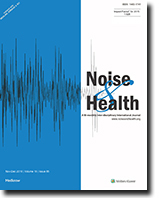 Materials and Methods: Ninety-three male participants were included in this study from aeronautic technicians: 39 with and 54 without a history of wide band noise (WBN) exposure. For better discrimination, the participants were divided into the two age groups: <40 and >40 years old. Adjusted aortic augmentation index (AI) for a heart rate equal to 75 beats per minute (AIx@HR75) were calculated using pulse wave analysis (PWA). CIMT was measured in 54 participants who accepted to undergo Doppler ultrasonography. Serum cystatin C was also measured. Results: Among younger individuals the mean CIMT was 0.85 ± 0.09 mm and 0.75 ± 0.22 mm in the in the exposed and the control groups respectively. Among older individuals CIMT had a mean of 1.04 ± 0.22 mm vs. 1.00 ± 0.25 mm for the exposed vs. the control group. However, in both age groups the difference was not significant at the 0.05 level. A comparison of AIx@HR75 between exposure group and control group both in younger age group (5.46 ± 11.22 vs. 8.56 ± 8.66) and older age group (17.55 ± 10.07 vs. 16.61 ± 5.77) revealed no significant difference. We did not find any significant correlation between CIMT and AIx@HR75 in exposed group (r = 0.314, P value = 0.145) but the correlation was significant in control group (r = 0.455, P value = 0.019). Serum cystatin C level was significantly lower in individuals with WBN exposure compared to controls (441.10 ± 104.70 ng/L vs. 616.89 ± 136.14, P value < 0.001) both in younger and older groups. Conclusion: We could not find any evidence for the association of WBN exposure with arterial properties, but cystatin C was significantly lower in the exposed group. Purpose: Although farm operators have frequent exposure to hazardous noise and high rates of noise-induced hearing loss, they have low use of hearing protection devices (HPDs). Women represent about one-third of farm operators, and their numbers are climbing. However, among published studies examining use of HPDs in this worker group, none have examined gender-related differences. The purpose of this study was to examine gender-related differences in use of hearing protection and related predictors among farm operators. Materials and Methods: Data previously collected at farm shows and by telephone were analyzed using t-tests and generalized linear model with zero inflated negative binomial (ZINB) distribution. Findings: The difference in rate of hearing protector use between men and women farm operators was not significant. There was no difference between men and women in most hearing protector-related attitudes and beliefs. Conclusion: Although men and women farm operators had similar rates of use of hearing protectors when working in high-noise environments, attitudes about HPD use differed. Specifically, interpersonal role modeling was a predictor of HPD use among women, but not for men. 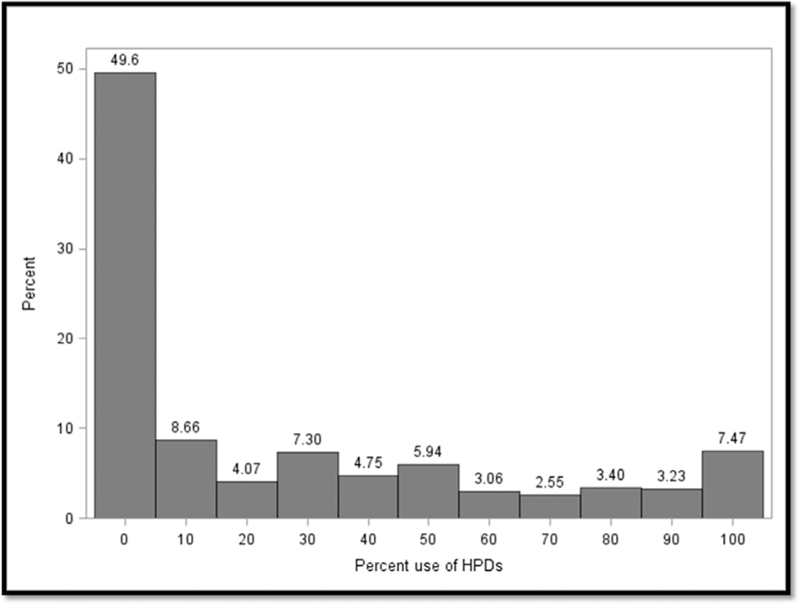 This difference suggests that while farm operators of both genders may benefit from interventions designed to reduce barriers to HPD use (e.g., difficulty communicating with co-workers and hearing warning sounds), farm women have unique needs in relation to cognitive-perceptual factors that predict HPD use. Women farm operators may lack role models for use of HPDs (e.g., in peers and advertising), contributing to their less frequent use of protection. Introduction: Speech perception in noise relies on the capacity of the auditory system to process complex sounds using sensory and cognitive skills. The possibility that these can be trained during adulthood is of special interest in auditory disorders, where speech in noise perception becomes compromised. Air traffic controllers (ATC) are constantly exposed to radio communication, a situation that seems to produce auditory learning. The objective of this study has been to quantify this effect. 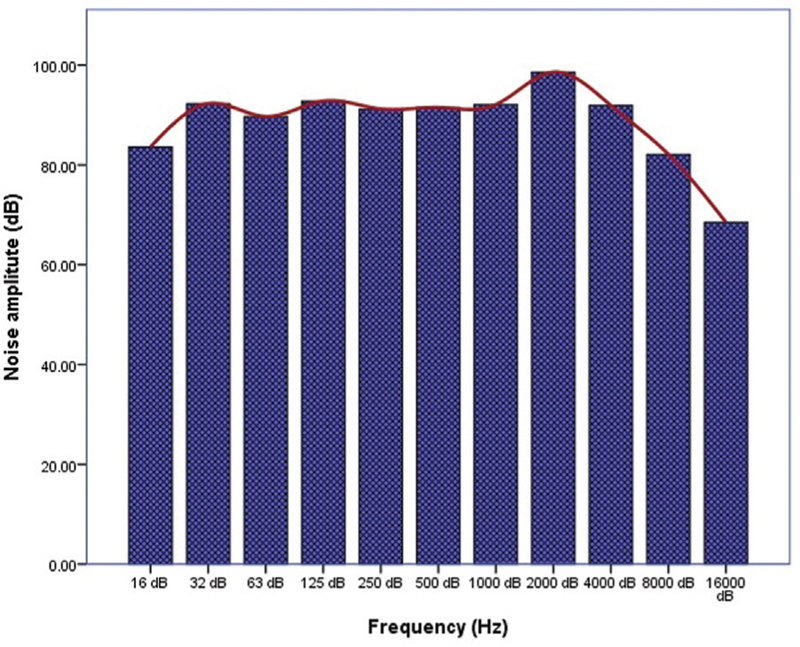 Subjects and Methods: 19 ATC and 19 normal hearing individuals underwent a speech in noise test with three signal to noise ratios: 5, 0 and −5 dB. Noise and speech were presented through two different loudspeakers in azimuth position. Speech tokes were presented at 65 dB SPL, while white noise files were at 60, 65 and 70 dB respectively. Results: Air traffic controllers outperform the control group in all conditions [P<0.05 in ANOVA and Mann-Whitney U tests]. Group differences were largest in the most difficult condition, SNR=−5 dB. However, no correlation between experience and performance were found for any of the conditions tested. The reason might be that ceiling performance is achieved much faster than the minimum experience time recorded, 5 years, although intrinsic cognitive abilities cannot be disregarded. Discussion: ATC demonstrated enhanced ability to hear speech in challenging listening environments. This study provides evidence that long-term auditory training is indeed useful in achieving better speech-in-noise understanding even in adverse conditions, although good cognitive qualities are likely to be a basic requirement for this training to be effective. 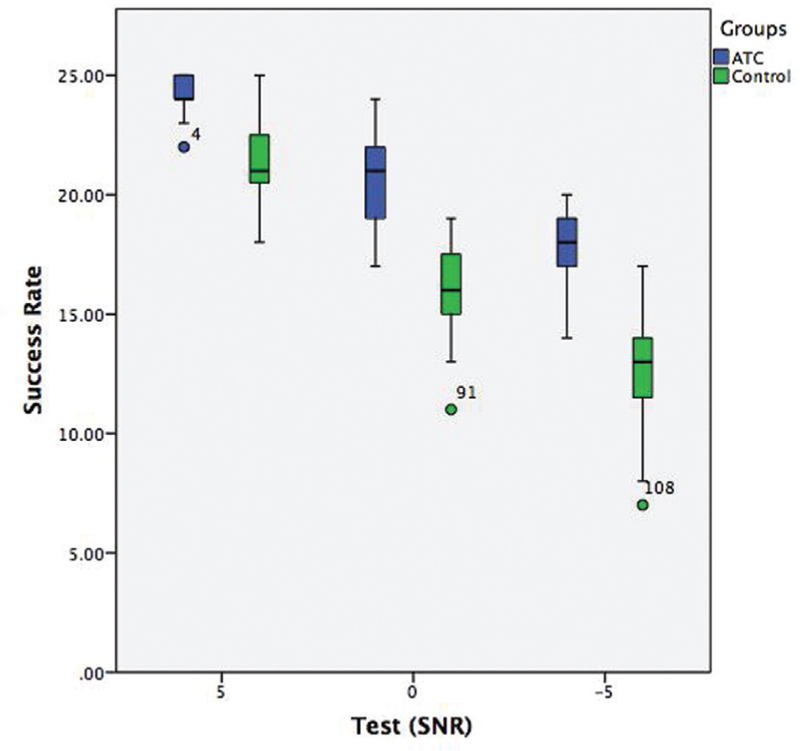 Conclusion: Our results show that ATC outperform the control group in all conditions. Thus, this study provides evidence that long-term auditory training is indeed useful in achieving better speech-in-noise understanding even in adverse conditions. Aim: To investigate in this cross-sectional study among Swedish hunters if tobacco use modifies the previously observed association, expressed as prevalence ratio (PR), between unprotected exposure to impulse noise from hunting rifle caliber (HRC) weapons and high-frequency hearing impairment (HFHI). Settings and Design: A nationwide cross-sectional epidemiologic study was conducted among Swedish sport hunters in 2012. Materials and Methods: The study was Internet-based and consisted of a questionnaire and an Internet-based audiometry test. Results: In all, 202 hunters completed a questionnaire regarding the hearing test. Associations were modeled using Poisson regression. Current, daily use of tobacco was reported by 61 hunters (19 used cigarettes, 47 moist snuff, and 5 both). Tobacco users tended to be younger, fire more shots with HRC weapons, and report more hunting days. Their adjusted PR (1–6 unprotected HRC shots versus 0) was 3.2 (1.4–6.7), P < 0.01. 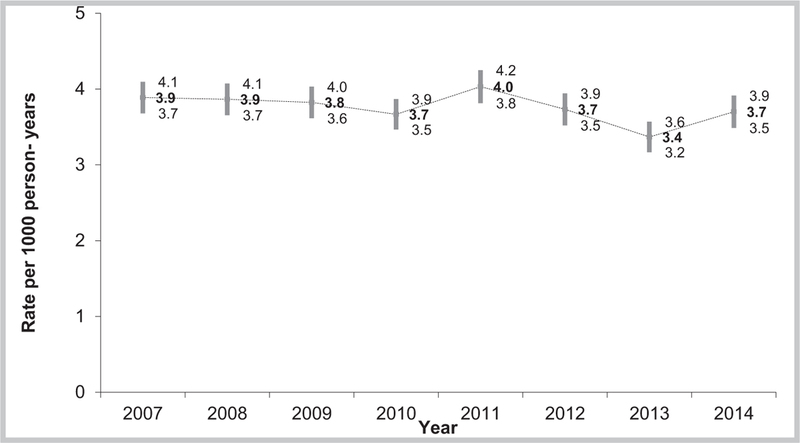 Among the nonusers of tobacco, the corresponding PR was 1.3 (0.9–1.8), P = 0.18. P value for the interaction was 0.01. The importance of ear protection could not be quantified among hunters with HRC weapons because our data suggested that the HFHI outcome had led to changes in the use of such protection. Among hunters using weapons with less sound energy, however, no or sporadic use of hearing protection was linked to a 60% higher prevalence of HFHI, relative to habitual use. Conclusion: Tobacco use modifies the association between exposure to unprotected impulse noise from HRC weapons and the probability of having HFHI among susceptible hunters. The mechanisms remain to be clarified, but because the effect modification was apparent also among the users of smokeless tobacco, combustion products may not be critical for this effect. Introduction: Noise is considered as the most common cause of harmful physical effects in the workplace. A sound that is generated from within the inner ear is known as an otoacoustic emission (OAE). Distortion-product otoacoustic emissions (DPOAEs) assess evoked emission and hearing capacity. The aim of this study was to assess the signal-to-noise ratio in different frequencies and at different times of the shift work in workers exposed to various levels of noise. It was also aimed to provide a statistical model for signal-to-noise ratio (SNR) of OAEs in different frequencies based on the two variables of sound pressure level (SPL) and exposure time. Materials and Methods: This case–control study was conducted on 45 workers during autumn 2014. The workers were divided into three groups based on the level of noise exposure. The SNR was measured in frequencies of 1000, 2000, 3000, 4000, and 6000 Hz in both ears, and in three different time intervals during the shift work. According to the inclusion criterion, SNR of 6 dB or greater was included in the study. The analysis was performed using repeated measurements of analysis of variance, spearman correlation coefficient, and paired samples t-test. Results: The results showed that there was no statistically significant difference between the three exposed groups in terms of the mean values of SNR (P > 0.05). Only in signal pressure levels of 88 dBA with an interval time of 10:30–11:00 AM, there was a statistically significant difference between the right and left ears with the mean SNR values of 3000 frequency (P = 0.038). 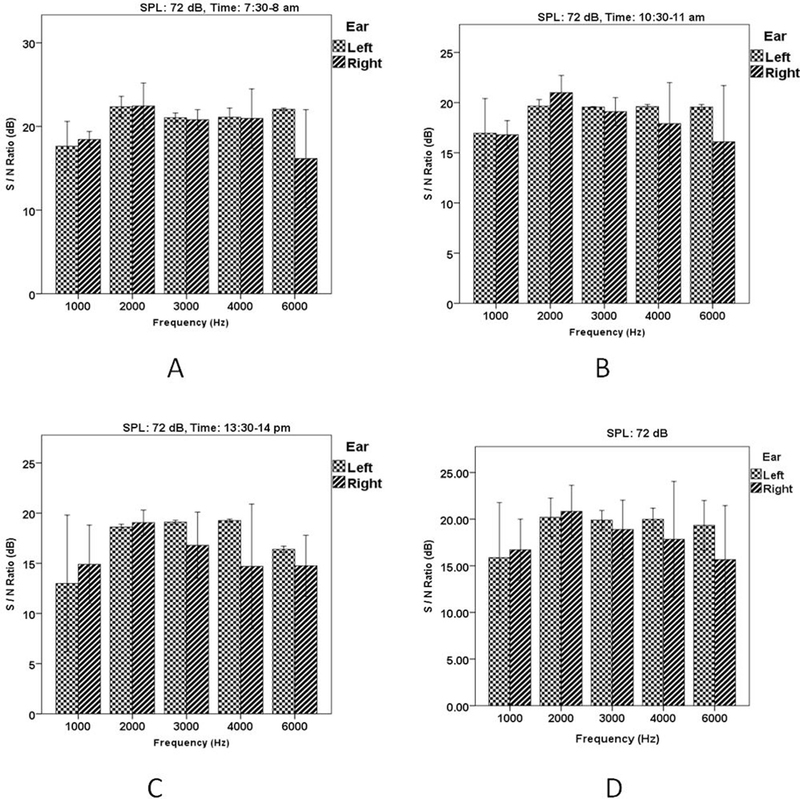 The SPL had a significant effect on the SNR in both the right and left ears (P = 0.023, P = 0.041). The effect of the duration of measurement on the SNR was statistically significant in both the right and left ears (P = 0.027, P < 0.001). Conclusion: The findings of this study demonstrated that after noise exposure during the shift, SNR of OAEs reduced from the beginning to the end of the shift.